The Jacksonville Transportation Authority's (JTA's) plan to replace the Skyway with a system featuring autonomous vehicles called the 'Ultimate Urban Circulator' (U2C) would expand the system into some coveted areas near Downtown. More controversially, it also calls for a new, multi-million dollar bridge over the St. Johns. But by focusing primarily on trendy neighborhoods, JTA misses a golden opportunity to serve (and spark revitalization in) the dense black neighborhoods surrounding Downtown where residents already rely on transit. JTA proposes to replace the Skyway’s outdated monorail vehicles with autonomous vehicles - essentially small, driverless buses. 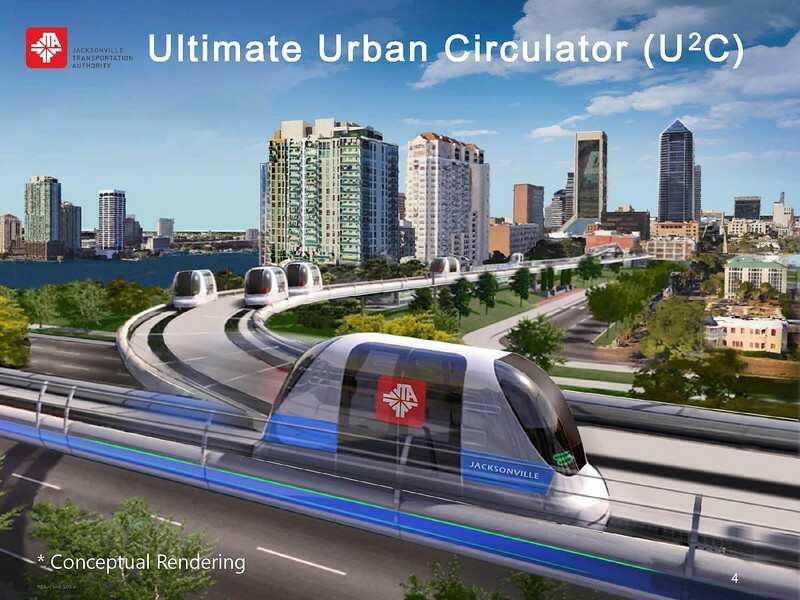 JTA’s Ultimate Urban Circulator (U2C) plans call for autonomous vehicles that could travel on the existing elevated Skyway infrastructure and also run down to the city streets to reach nearby neighborhoods. These ambitious plans call for expanding Skyway service at street level through Brooklyn toward Riverside, north into Springfield, east to the Stadium District, and south to San Marco. The current proposal also includes a seemingly odd element: a new bridge over the St. Johns River, joining the Stadium District to the Southbank. As we covered in our editorial on JTA’s Skyway plans, there’s much to be skeptical about in JTA’s proposals, ranging from potential capacity limitations, the lack of embracing the importance of dedicated right-of-way, a failure to fully capitalize on economic development opportunities, and that horrible, no good, very bad new name. But beyond those concerns, JTA is right on the money in understanding that expanding the system into nearby residential neighborhoods where riders actually live is necessary for the system to ever improve. However, some elements of the Skyway expansion plans need to be seriously retooled if we are to get a system that really serves Jacksonville’s needs. A conceptual rendering of the proposed river crossing. Current Skyway expansion plans include a bridge that would carry the transit system across the St. Johns River between the sports complex and the Southbank, at the planned District development - two areas that are years away from having any residents. This bridge wouldn’t allow cars, but would include a crossing for bicycles and pedestrians. It would be the second river crossing for the Skyway, which also crosses over the Acosta Bridge. Frankly, this proposal is totally untenable. JTA hasn’t given price estimates, but the cost of any river crossing would be astronomical. The Acosta Bridge cost $95.4 million in 1995. Adjusted for inflation, that would be over $158 million today, to cross a river the Skyway already crosses. In 2004, the FDOT estimated it would cost as much as $700 million to replace the Mathews Bridge. Other details make the bridge even less feasible. 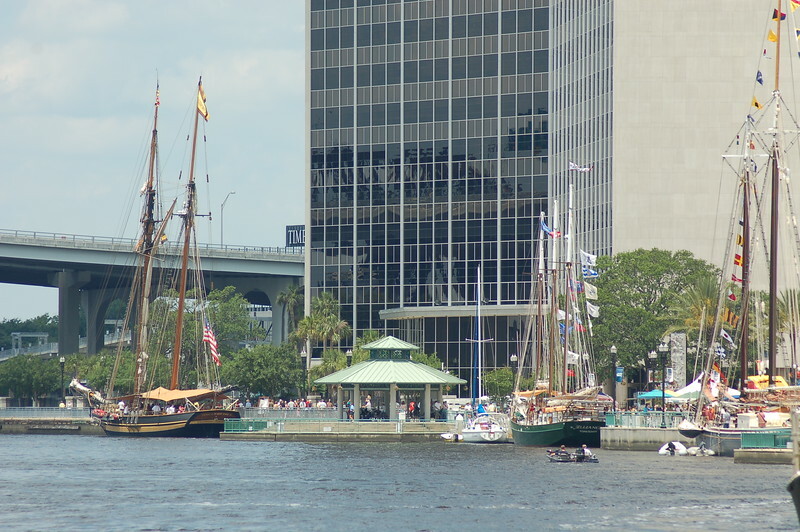 JTA’s images don’t appear to show a drawbridge or lift bridge (like the Main Street Bridge), which would prevent large boats from passing under. Remember Shad Khan’s yacht downtown and those cruise ships during Super Bowl XXXIX? Forget about that happening ever again without a drawbridge or lift. If constructed as illustrated, a new river crossing would permanently limit tall ships from having access to the Northbank riverfront. Perhaps JTA conceives of a bridge high enough for boats to pass under. That would be even tougher - it would need a vertical clearance of at least 135 feet (the height of the Main Street Bridge when raised). A bridge that high, especially one carrying pedestrians and cyclists, would have some truly insane approaches to tackle - it would almost certainly eat into waterfront property on both banks to accommodate the ramps needed to get back to street level. If JTA is serious about expanding the Skyway into urban core neighborhoods surrounding downtown, this proposed bridge should go the way of the one over the River Kwai. Fortunately, axing the bridge would save more than enough money to expand the Skyway in ways that would have a much bigger impact than a redundant bridge ever could.